Rolex Yacht Master ladies two tone watches sized 29mm make a bold statement upon the wrist. Currently, we feature a Yacht-Master timepiece with 18K yellow gold and stainless steel Oyster bracelet, with 18K yellow gold bezel. We think you’ll agree, this timepiece is positively stunning for any occasion. Also, we’re confident that you’ll find a Yacht Master timepiece to fit your style and budget.  In addition, BeckerTime offers a 30-day money-back guarantee with each purchase, as well as a Lifetime TradeUp Guarantee. We strive for your 100% satisfaction. So, let us help you find that perfect style. Therefore, don’t hesitate to contact us if we can assist you. As we continue our spotlight on the luxurious, yet sporty, Rolex Yacht Master collection, we now turn our attention to all about the ladies two tone Yacht Master. If you’ve had your eye on this special timepiece, either for yourself or for someone special, here’s everything you need to know about this Rolesor beauty. The very first ladies two tone Yacht Master ref. 69623 made its debut in the mid-1990s, crafted in both stainless steel and 18k yellow gold. It’s important to remember that Rolex refers to the material combination of steel and gold as Rolesor. As a ladies model, the Rolesor Yacht Master ref. 69623 sports a case sized at 29mm. Although small, it’s still very sporty thanks to its design. Firstly, there’s the stainless steel Oyster case outfitted with a Twinlock winding crown. Then, topping the case is a stunning 18k yellow gold bi-directional bezel with raised numerals. Furthermore, the precious metal carries through to the sporty Oyster three-links bracelet. As with most Rolesor models, the Oyster bracelet of the ladies two tone Yacht Master ref. 69623 features stainless steel outer links flanking 18k yellow gold center links. Securing the Oyster bracelet is the Fliplock clasp. The ladies two tone Yacht Master ref. 69623 runs on the Rolex Cal. 2135 automatic mechanical movement, operating at 28,000 beats per hour and offering around 48 hours of power reserve. 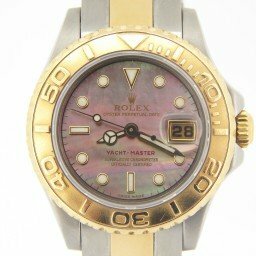 In 1999 Rolex updated the ladies two tone Yacht Master with the introduction of the ref. 169623. While the look of the Rolesor women’s Yacht Master remained largely the same, the biggest change was the movement within. Powering the then-new ladies two tone Yacht Master ref. 169623 was the highly reliable, robust, and precise Rolex Cal. 2235 self-winding movement. Just like its predecessor, it beats at a rate of 28,000 bph, includes 48 hours of power reserve, and includes a quickset date function. The ladies two tone Yacht Master ref. 169623 comes with a range of dial options including white, champagne, slate, and navy blue. For added luxury, there are also mother-of-pearl and diamond dials to choose from. Similar to the first generation, the dial of the ladies’ Yacht Master ref. 169623 includes round indexes, Mercedes-style center hands, a lollipop seconds hand, and a red YACHT-Master label. The versions with the black indexes are, in fact, not luminescent but rather are accented with small triangles that glow in the dark to provide low-light legibility. Unfortunately, since 2012 Rolex stopped manufacturing the ladies two tone Yacht Master. But thankfully, both Rolesor Yacht Master ref. 69623 and ref. 169623 watches are still available in the secondary market. Depending on the reference, year, dial, and condition, a pre-owned ladies two tone Yacht Master can start at less than $5,000. 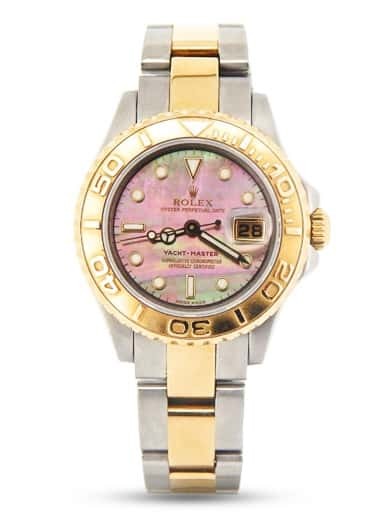 That’s undoubtedly a bargain for a two tone steel and gold women’s Rolex sports watch! Despite the fact that the ladies two tone Yacht Master is currently out of production, it remains a classic luxury sports watch for women. Offering both elegance and sportiness, the Rolesor Yacht Master for ladies is one not to miss.